Mischief Theatre’s Peter Pan Goes Wrong returns to the West End for a second disastrous limited season after its huge sucess last year. Once again the members of the Cornley Polytechnic Drama Society battle against technical hitches, flying mishaps and cast disputes. Will they ever make it to Neverland?For the slickest show in the West End, DON’T see Peter Pan Goes Wrong! 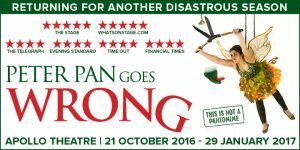 Book Peter Pan Goes Wrong tickets from £15! Tagged Apollo Theatre London, London, panto, pantomime, Peter Pan.